Here’s a work in progress for a game I’m planning to run during Ramadan, a few weeks hence. I’m slowly refining my technique for creating shaded relief maps in Campaign Cartographer 3 . I imported GTOPO30 data into Fractal Terrains and created a lighting file customised to the map – one to show the mountains as brown and the peaks grey/white. I saved the results as a CC2 file (oh for a proper CC3 export), measured the dimensions of the CC2 map, and then exported the PNG from FT at a resolution of x5 the CC2 dimensions. In PaintShop Pro I selected and deleted the sea to make it transparent (I wanted the CC sea to show). I also reduced the luminance and tinkered with the dark/mid/high levels – I wanted the terrain to be visible, but not overpowering. I find this much easier to do in PSP than using CC3 sheet effects, which are somewhat cluncky for this kind of work, and prone to crash on this sort of thing. I then inserted the PNG into CC3 and started creating and ordering sheets, moving elements between them to make what I wanted visible and prepare for the eventual sheet effects. Province borders were traced off a public domain map I found on wikipedia, and names added from another online map. Yes, I know I’m claiming this as a Sengoku=era map, and that the provinces were virtually non-existent in the Sengoku period – but they’re still useful divisions for creating more detailed area maps. Finally, I worked on sheet effects until the province names were legible over the terrain, and made the province boundaries transparent. I need to rework the contour bar to give it fewer divisions, and come up with an appropriately Japanese cartouche and other decorations. 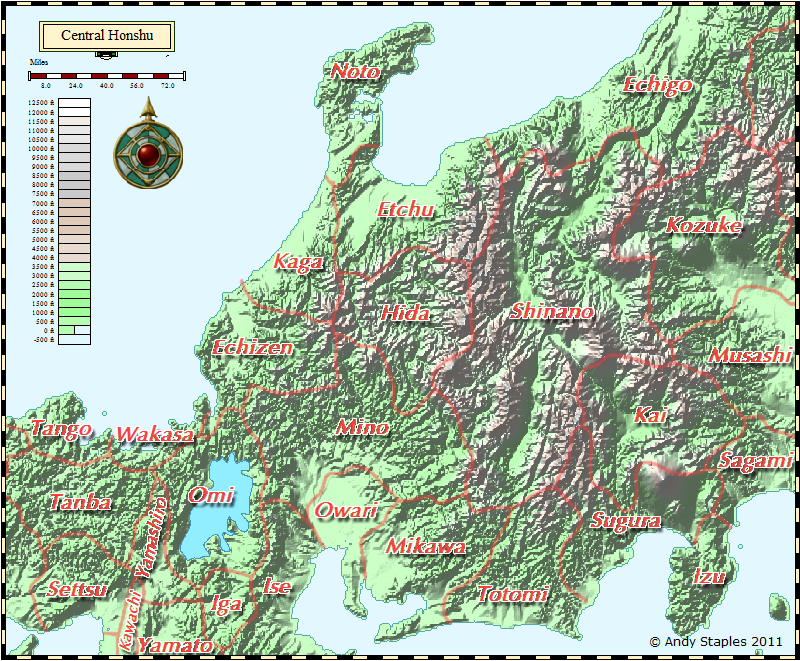 Also need to add a few towns and label notable features like Fujiyama (that’s it, down in the bottom right). And I’m debating about making Lake Biwa the same colour as the sea, and I’ll probably make the province names black. I’ll then start on a more detailed map of Hida province, which will have more fictional elements in it (I simply don’t have enough historical information to make it a historical map – which is probably a good thing as far as my players are concerned; I have a terrible tendency to get sidetracked by research instead of actually preparing a game). This entry was posted in Gaming, History and tagged Campaign Cartographer, Chrysanthemum War, Japan, maps. Bookmark the permalink.